Coach Augustavo’s Vikings have been knocking on the door of a 4A state championship for the past handful of seasons. With one game separating Inglemoor from reaching the title game, the quest for the hardware is within reach. 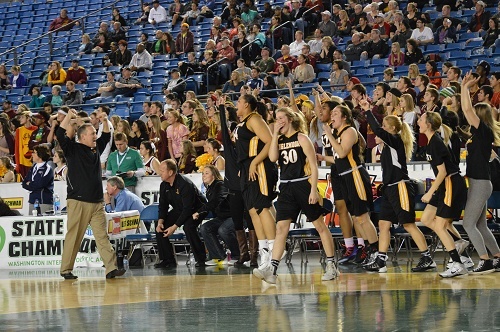 However, Moses Lake is no stranger to the Tacoma Dome and the Chiefs also have their sights set on advancing to the final round of the tourney. They defeated Skyview by double digits to advance to the semis while Inglemoor squashed Bellarmine Prep to advance to the second round. In a classic east versus west showdown, which team would prevail? IHS senior Alex Hagen helped the Viks jump out to an efficient first half in which they shot 44% from the floor and grabbed a ten point lead early at 15-5. Conversely, the Chiefs were just 8 for 32 from the field in the first two quarters and faced a half dozen point deficit at the break. The size advantage by Inglemoor was evident as the rebounding advantage and points in the paint favored the Vikings. 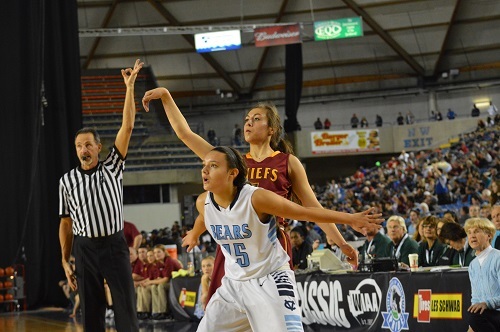 Moses Lake needed huge contributions from their guards throughout the contest. Jamie Loera and McKenna Walker answered the call, but would it be enough to prevail in the second half. Moses Lake returned from the intermission with the biggest run of the game to tie up the ballgame and give themselves a coin flip in the final frame. Loera and Walker combined for 42 points and 10 boards while the Viks had four scorers in double figures inclduding Hagen with 20. The 17 point rebound difference in the game played a major role in allowing Inglemoor to get additional looks at the offensive end and ultimately stringing together a 26 point fourth quarter to seal the victory and a trip to the state final.